Current: Even-Handed or Heavy-Handed Relations? Both versions accurately describe the same complex reality. But even if one were to describe this reality as a glass more half-full than half-empty, there are real risks the glass could empty out. That’s because many of the positive elements of the relationship are narrowly compartmentalized, with only a few people aware of their benefits. EU-Israel cooperation projects in the areas of security or research are such examples. But the tensions between the two play out in the open, generating negative feedback that could undermine this relationship in the long run. Israel-critical statements can reinforce Israel’s negative image among Europe’s public, which in turn would make it more difficult for European politicians to advocate for closer relations with Israel or to support its right to self-defense. This, in turn, can feed even more negative attitudes among the public. Even more alarmingly, surveys show not only Israel-critical sentiments among the European public, but also views that cross the line and express modern forms of anti-Semitism. When segments of the European population compare Israel with Nazis or hold Jews collectively responsible for Israel’s actions, real or imagined, more than just the future of bilateral trade is at stake. Further fueling tension is the European Union’s propensity to look at its relationship with the Jewish state through the prism of the Israeli-Palestinian conflict. That conflict, or to be more precise, Europe’s disagreement with Israel over its root causes and specifically the settlement policy, impacts almost every aspect of the bilateral relationship. Even such positive elements as cooperation agreements, for example, must include, on the European Union’s insistence, so-called territorial clauses ensuring that the terms of the deal do not apply to what the European Union considers occupied territory. What’s worse, in 2009, the EU Council effectively froze plans for an upgrade of Israel’s Association Agreement, linking any progress on this front to progress in the peace process. This decision implied that Israel is not only the stronger party in this conflict, but that it has the power to end it unilaterally. The European Union thus ignored the old dictum that it takes only one to make war, but two to make peace. It also ignored 80 years of repeated Palestinian refusals to end this conflict through a territorial compromise, starting with the 1937 Peel Plan. At the same time, the EU Council decision ultimately rewarded Palestinian intransigence by giving them veto power over the EU-Israel relationship. What seems to be missing from the EU analysis of the Israeli-Palestinian conflict is an evidence-based review of why, 25 years after the Oslo accords, there still is no Palestinian state. Even if one ignored that Gaza is controlled by a group the European Union itself considers to be a terror organization and focused instead just on the Palestinian Authority, Israel’s purported peace partner, severe shortcomings are evident on the Palestinian side. The Palestinian Authority has repeatedly refused serious Israeli peace offers, continues to incite its public against Israelis and Jews in general, and has so utterly failed in the state-building process that it is incapable of signing any realistic peace deal, let alone implement one. Even when the European Union does acknowledge some of these problems on the Palestinian side, it often draws very different conclusions. Citing the lack of stability in the Palestinian leadership, European officials argued in previous years that Israel ought to hurry to make peace with the Palestinian Authority because nobody knows who may come after Chairman Mahmoud Abbas. What was interpreted by Europeans as an incentive for Israel to come to a quick agreement was interpreted by Israelis as the exact opposite. Not surprisingly, Israelis consider the fact that Abbas could conceivably be succeeded by a Fatah member who will resort to violence again, or that the entire Fatah leadership could be swept away by Hamas (as has happened in Gaza), as a liability, not an opportunity. European efforts to address such Palestinian liabilities tend to lack the seriousness with which Brussels addresses the obstacles to peace it identifies on the Israeli side. This imbalance undermines Europe’s position as an honest broker in the eyes of many Israelis. And in addition, Europe is missing an opportunity to help resolve the conflict. While EU criticism of Israel is usually explicit and detailed, criticism of Palestinian incitement, for example, tends to be rare and circumspect. Moreover, while the European Union has developed very elaborate policies such as the territorial clause and labeling guidelines to oppose Israeli settlement policies, no similarly exhaustive policies exist to confront Palestinian obstacles to peace. Take, for example, the PA payments to jailed Palestinian terrorists and their families. These salaries are linked to the length of the Israeli prison sentences, meaning the more gruesome the crime, the more money the convicted terrorists or their families receive. These payments, often a multiple of the average Palestinian salary, not only reward past terrorism but create a clear incentive to carry out future terror attacks. At the same time, by wasting an astonishing seven percent of the PA budget on these perverse salaries, the Palestinian Authority is depriving its population of scarce resources. It is difficult to imagine a policy more at odds with EU values and the stated EU goal of achieving peace between Israelis and Palestinians. And yet it is equally difficult to find public European condemnations of this practice, let alone concrete plans to put an end to it. The European Union’s reluctance to confront Palestinian obstacles to peace contradicts its often-voiced complaint that Europe is only a “payer and not a player” in the Israeli-Palestinian conflict. If the European Union isn’t a player, it’s mostly because it refuses to touch the (Palestinian) ball. Because the European Union is such a big payer, i.e., economic and diplomatic supporter of the Palestinian Authority, it could exert tremendous influence in Ramallah. By failing to make full use of this influence to steer the Palestinian Authority and society in a more peaceful direction, Brussels is missing a huge opportunity to help solve the conflict. At the same time, this reluctance also undermines Europe’s influence over the Israeli political scene. Because Europe is seen as one-sided, it is domestically easier for Israeli politicians to ignore its criticism. Rebalancing the EU-Israel relationship would offer Brussels (the EU headquarters) numerous advantages. 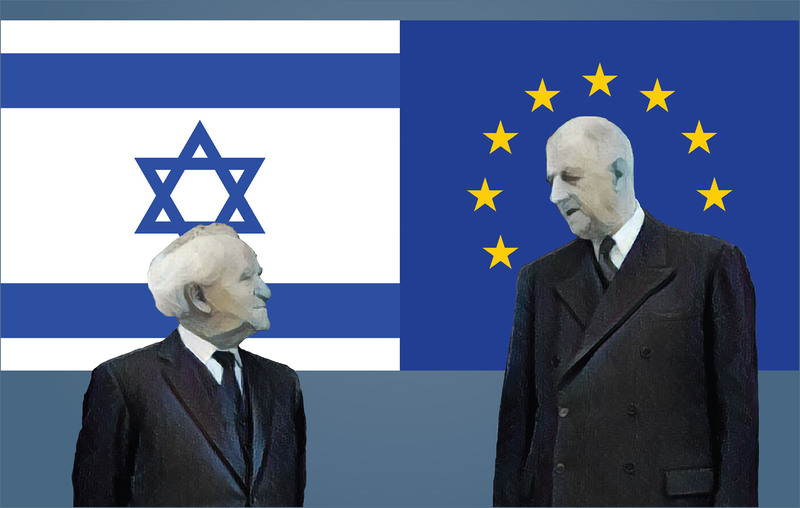 By cutting the connection between progress on the conflict and upgrading its Association Agreement with the Jewish state, Brussels could deepen a mutually beneficial relationship. By devising effective policies designed to confront Palestinian obstacles to peace, the European Union could contribute significantly to Arab-Israeli reconciliation and at the same time improve its own standing before the Israeli public as an honest broker. A more realistic appreciation of Israel’s many security challenges could not only advance Israel’s safety but also greatly enhance regional stability. By discouraging more forcefully Israel’s opponents, the European Union could help prevent the outbreak of hostilities, saving lives on both sides. Each time, though, the European Union appears “even-handed” when commenting on unprovoked Hamas attacks and legitimate Israeli defense measures, or when it prematurely calls for “independent” investigations into Israeli actions, it plays into the terrorist propaganda strategy, encouraging only more attacks, leading to more casualties on both sides. And each time the European Union remains silent when Iranian leaders call for Israel’s destruction or appears unwilling to confront Iranian crimes at home and abroad, it increases the likelihood of a major confrontation. And it ultimately also deeply disappoints its Israeli ally, further undermining Europe’s standing in the Jewish state. The day such an evidence-based policy review enters into European decision-making vis-à-vis the Middle East will be the day when the state of the EU-Israel relationship won’t be up for debate anymore. It may also be the day that ushers in fresh hopes for the Israeli-Palestinian peace process.